Is Seared Tuna Safe in Pregnancy? Fish is a low-fat source of protein that also contains beneficial omega-3 fatty acids. The U.S. Department of Agriculture recommends that most people eat fish twice a week, and pregnant women should follow this guideline also. Because some species of fish contain harmful levels of methyl mercury, you should limit consumption of these fish, especially during pregnancy. But pregnant women can safely eat smaller amounts of fish, including tuna. Methyl mercury is present in many fish species. Because methyl mercury can impede an unborn child's development, the USDA advises that you do not eat tilefish, king mackerel, swordfish and shark if you are pregnant. In some areas, fish contain harmful levels of polychlorinated biphenyls, or PCBs, which can also cause health problems. However, the USDA says harmful levels of PCBs have not been found in any fish sold commercially. Most of the tuna Americans eat is canned tuna, both light and Albacore. Albacore, or white tuna, may contain higher levels of mercury, but the USDA says it's still safe to eat up to 6 ounces of this tuna each week while pregnant. Other species of tuna, such as yellowfin, don't have as high a level of mercury. Pregnant women can eat up to 12 ounces a week of these and other fish. Undercooked food can harbor bacteria that could be harmful to a pregnant woman. If you're pregnant and eating tuna, make sure it's cooked to an internal temperature of at least 145 degrees Fahrenheit, advises the Colorado State University Extension. Seared tuna, which is often left rare in the middle, may be unsafe during pregnancy. 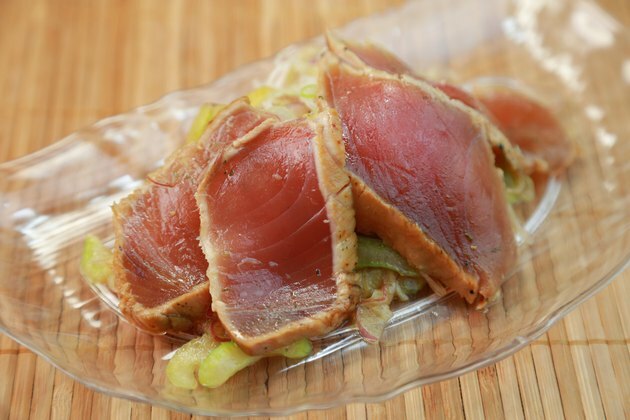 If you're making seared tuna at home, you can check the internal temperature with a cooking thermometer, but you can't be as sure about restaurant tuna, so choose another cooking style, such as broiled or baked. Buy the freshest fish possible. Fresh fish should have firm flesh that springs back when you touch it, and shouldn't smell fishy. Don't buy frozen fish that has frost crystals inside the package. This could mean the fish was thawed, then refrozen. Use fresh fish within two days of purchasing it, or wrap it tightly and freeze it. Thaw frozen fish in the refrigerator.